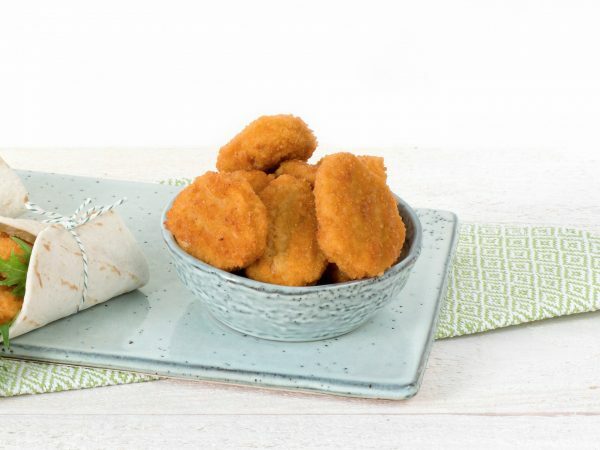 Crispy Nuggets based on pea protein and wheat protein. This product has a chicken-like texture and is a delicious vegetarian snack. A vegetarian Nugget weighs 20 grams. Water, breadcrumbs (wheat), 16% vegetable protein (wheat, pea), sunflower oil, wheat flour, egg white*, modified starch, salt, natural flavouring (wheat, celery), wheat starch, milk protein (lactose), dextrose, herbs and spices. * Free range eggs Produced in a facility that processes peanuts and nuts.